We at homify have a special property to show you today. 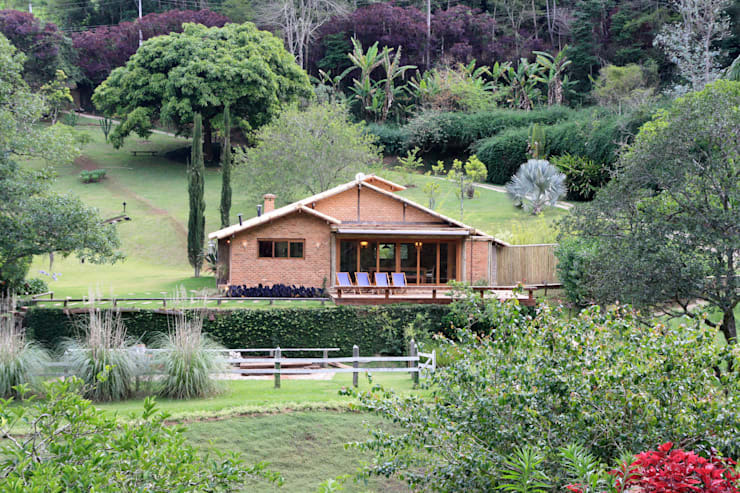 A wilderness retreat in an exotic natural park that blends perfectly into its environment. It's a cabin-style home, with design elements taken from all over the world and a wonderful attention to detail in its decor and lighting. The result is a warm, welcoming place to relax in, without the confines and pollution of urban life; a veritable haven where you can wake to the sounds of birds and the rustling of trees. So, without further ado, let's take a tour of this magical dwelling! In a stunning natural landscape such as this, you'd do well to adopt this excellent concept of sliding windows to allow the sweet fresh air into your home. Sash windows give an indication of the old world European style that we will view inside the house. The hanging lantern adds to this effect in a small way. Notice how the colour of the brickwork and window frame blends in with the general palette of the area, rather than standing out. For more examples of wilderness locations and natural homes, read on. You'll be drinking plenty of tea from a pot this size! Of course, it's meant as a decorative centrepiece on the dining table and gives us an indication of the colourful, humorous personality behind the designer of this house. Lime green kettle, purple cupboards and striped rug all add to this vibrant, easy-going style. 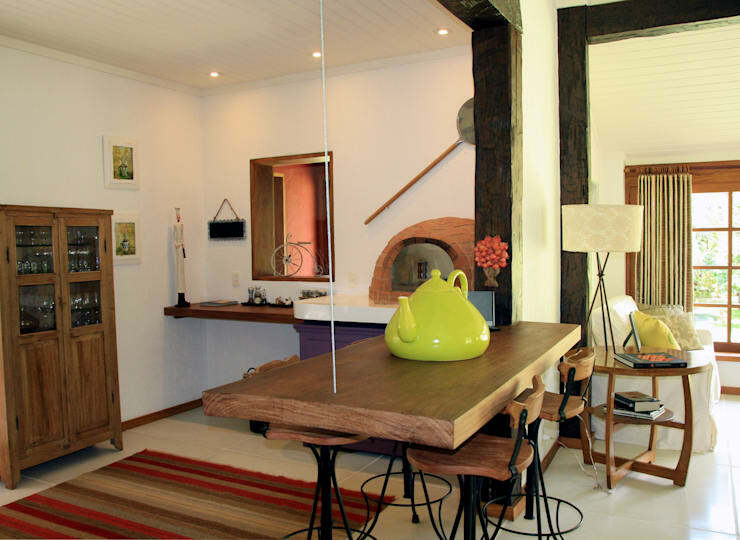 The floor-to-ceiling doorways are dark oak and complemented by the wooden breakfast table and chairs. This is a fun, open-plan area in which to have breakfast and talk with friends over some tea or coffee. The confluence of styles can be more clearly seen with this almost medieval sliding partition door. 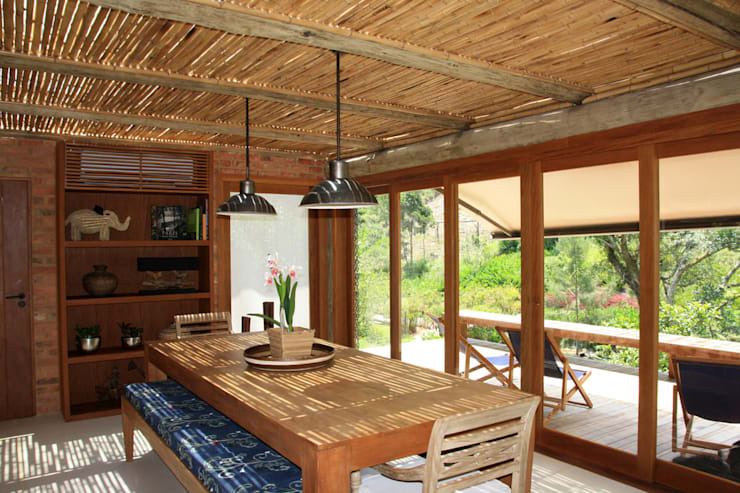 The bamboo ceiling and minimalist design has a touch of feudal Japan about it, as do the blue cushions on the dining table benches. Everything here is open and relaxed. 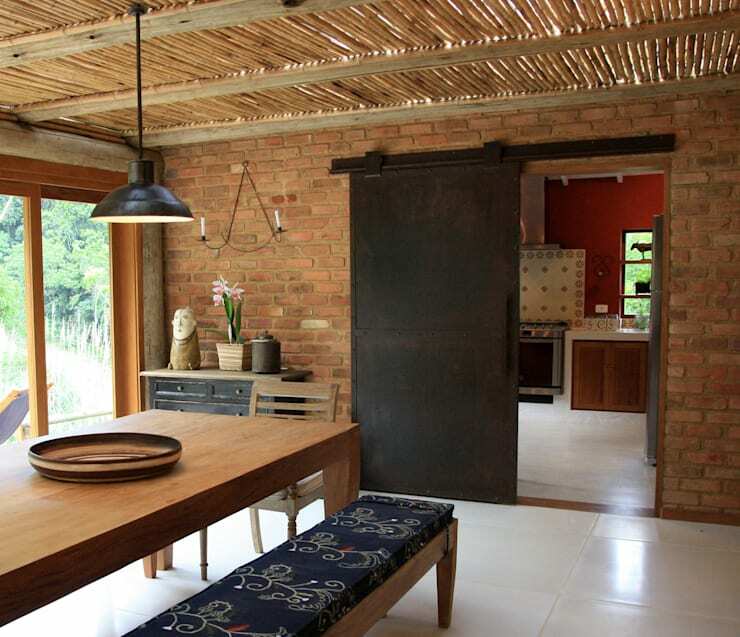 A feeling of calm pervades this room and is accentuated by the open brick wall that divides from the often busier area of the kitchen. The use of colour in making a room stand out can be best demonstrated by this image. 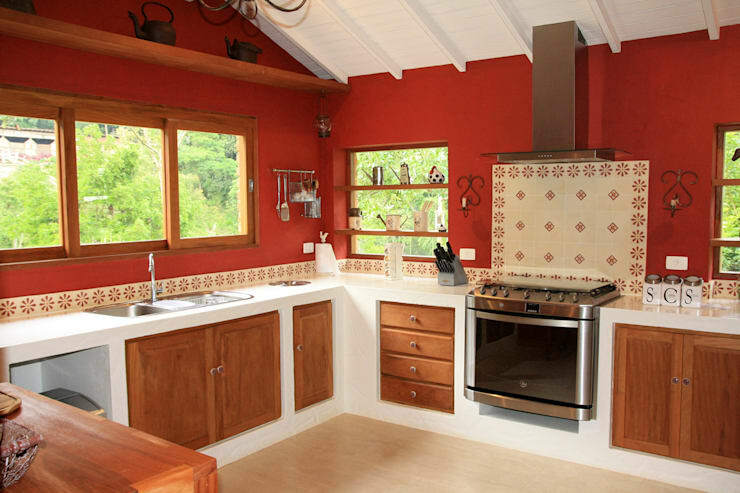 Bright red on the walls, white counters and warm wooden drawers and cupboards create a punchy, lively kitchen. The floor choice makes it a little softer on the eye, but one could also opt for a darker hue to give a more earthy feel. Here we have a brilliant example of how white walls and dark wood create a classic style that resonates with nature. 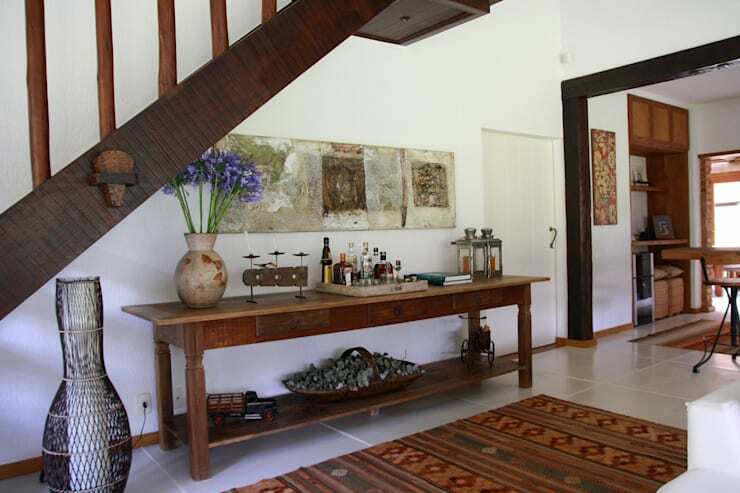 The beams of the stairway and door stand out against the walls, complementing the long entrance table where a curious collection of artefacts has been arranged. Mementos from travels and objects of interest give a unique style to this hallway. Notice the African-style rug and netted lamp, which work well with the overall theme. The designer has made excellent use of the landscape outside, fitting French doors which give the dining area splendid views. 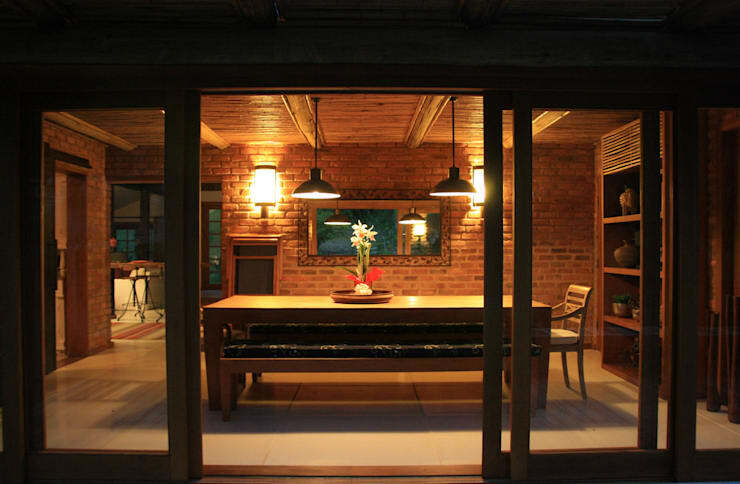 It's easy to imagine holding a family dinner and gazing out into the colourful garden. Here we have the purple cupboards, with creamy white counter and red brickwork, as a wonderful expression of style and character. The long-handled cooking pan is a relic of the old days, as is the penny-farthing bicycle ornament on the window sill. 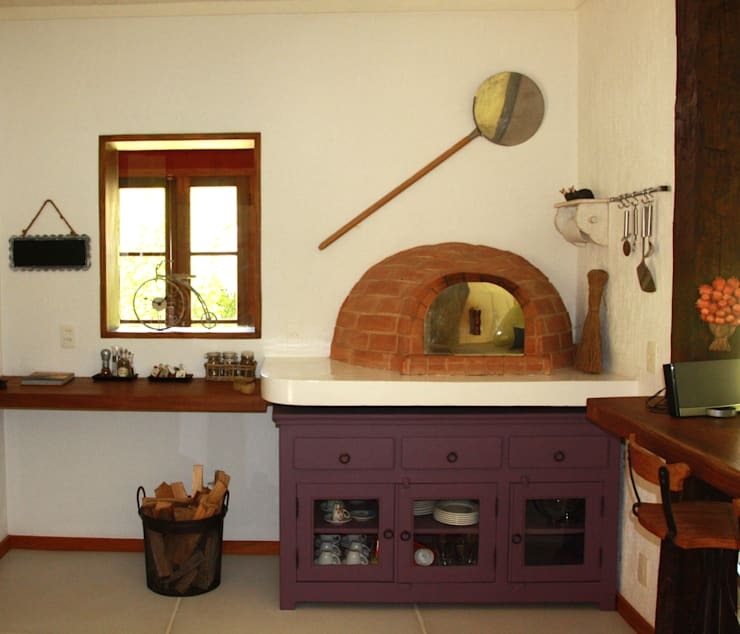 There is a classic country style displayed here, but with its own fun take on decor. Warm lighting works so well against the brick interior walls. When presented with elements of wood, such as the dining table, cabinets and patio door frames, the effect is enhanced tenfold! 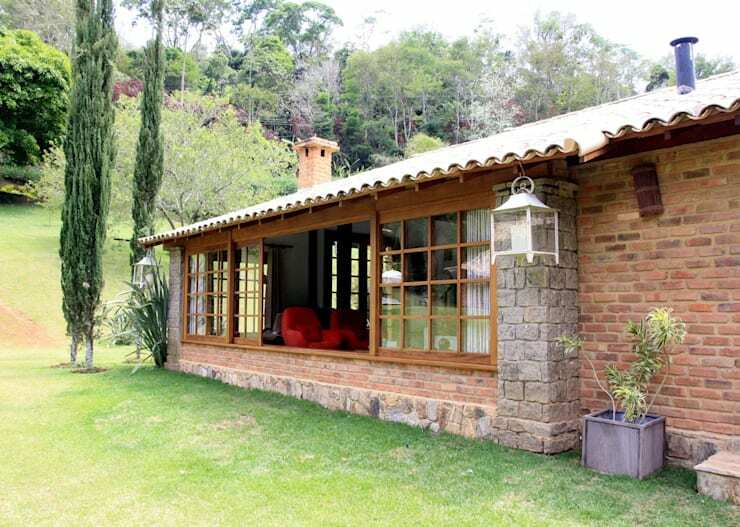 An architectural success, this property blends in well with the surrounding area in its colours, use of wood and charming structure. We hope you enjoyed this home tour as much as we did! Have you ever thought about living in the wilderness?